Thé et tisaneThere are 7 products. Compatible Dolce Gusto Tea capsules with delicious ginger and lemon blend. Enjoy the active ingredients of ginger to combine the useful with the pleasant. 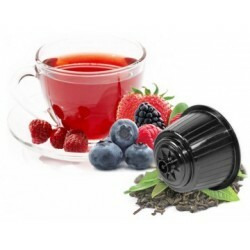 Black English Breakfast Tea Capsules compatible with Dolce Gusto ® machines. 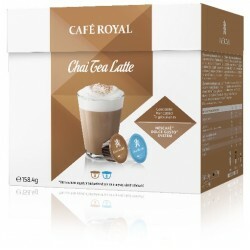 These English Breakfast tea capsules are made from black tea leaves that are relatively rich in theine. Dolce Gusto Compatible Wellness Capsules by the brand Tiziano Bonini. This capsule is an infusion made up of medicinal plants that can be tasted at any time of the day because it does not contain any theine. 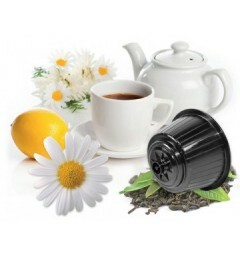 Chamomile Capsules compatible with Dolce Gusto ®. Enjoy all the virtues of chamomile in your Dolce Gusto ® machine, its natural taste will bring you a very pleasant feeling of peace. Thé aux herbes Fruit of the Woods compatible Dolce Gusto ®. Le mélange de ses beaux arômes de fruits des bois permet de consommer ce thé aux herbes en toutes saisons, en été vous pouvez le préparer au froid pour étancher votre soif et en hiver cette boisson chaude au pied de la cheminée sera un pur bonheur. 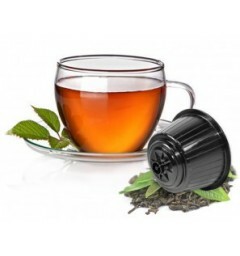 Mint Tea Capsules compatible with Dolce Gusto ® machines. These mint tea capsules can be consumed hot or cold.